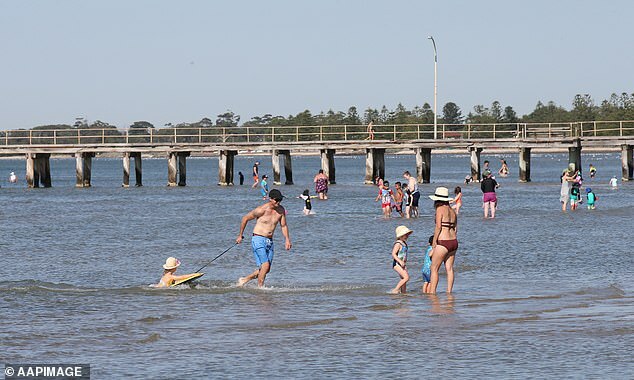 Victoria is expected to swelter through one of their hottest days in three years with temperatures caross Melbourne soaring to 42C. 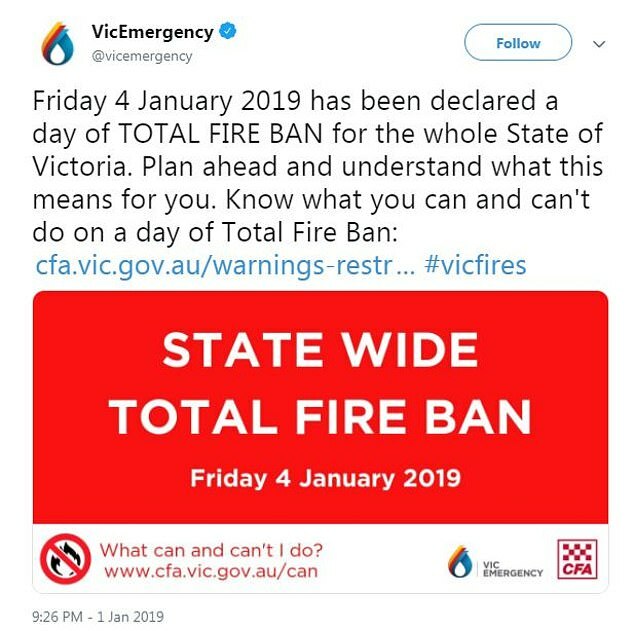 Emergency services have released severe weather warnings for parts of the state and warned of a state-wide total fire ban. The Bureau of Meteorology said the temperature would peak at about 4pm before falling. 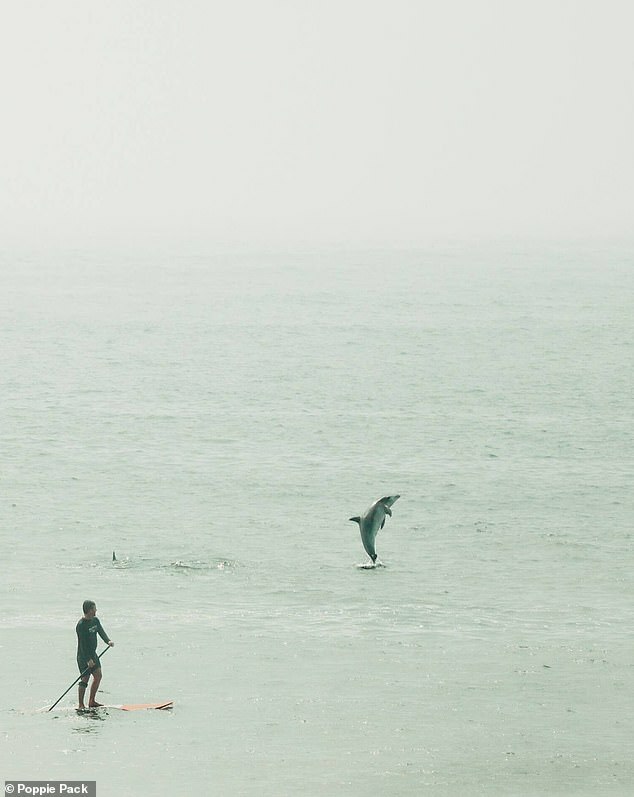 ‘After an early morning low of 19C around 4am expect a top of 42C near 4pm,’ the Bureau said on Twitter. Senior meteorologist at Weatherzone Jacob Cronje said the widespread distribution of the high temperatures across the state is quite unique. Bendigo, Shepparton and Swan Hill are expected to reach 45C and Mildura should hit 46C. Mr Cronje said it will be between 42C and 46C for most inland parts of the state except the south-west where conditions will be cooler. 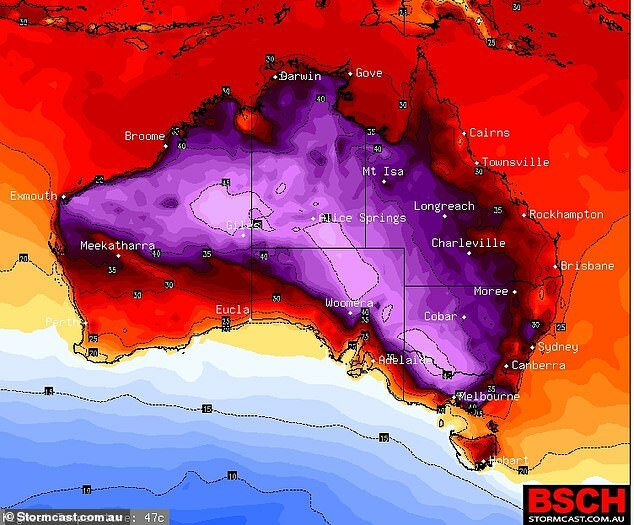 ‘It grades from the high 20s in the far south-west to about the high 30s over places like Hamilton and Edenhope and then further north and east it’s almost exclusively 40s,’ he told Daily Mail Australia. If Melbourne reaches the forecast, it will be its hottest day since January 2016 when the temperature hit 42.2C. 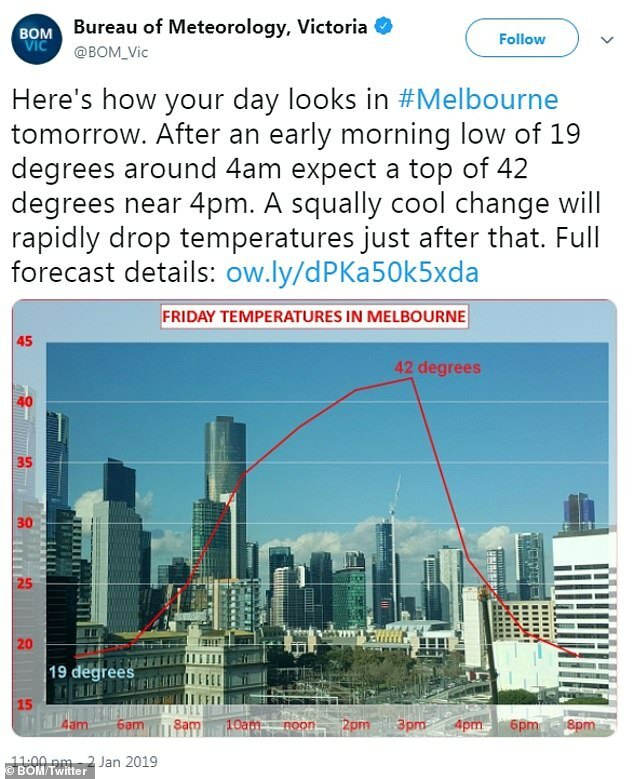 The high temperature in Melbourne is not anticipated to last long as the cool change coincides with the hottest time of the day. There is a fire ban across the state amid the soaring temperatures. ‘There’s extreme fire danger across four districts, Mallee, Wimmera, Northern Country and North Central,’ Mr Cronje said. Severe Fire Danger is also forecast for the South West, Central and West and South Gippsland districts. ‘Those northwesterly’s ahead of the cool change together with the southwesterly’s coming in behind that cool change certainly elevating fire danger,’ Mr Cronje said. 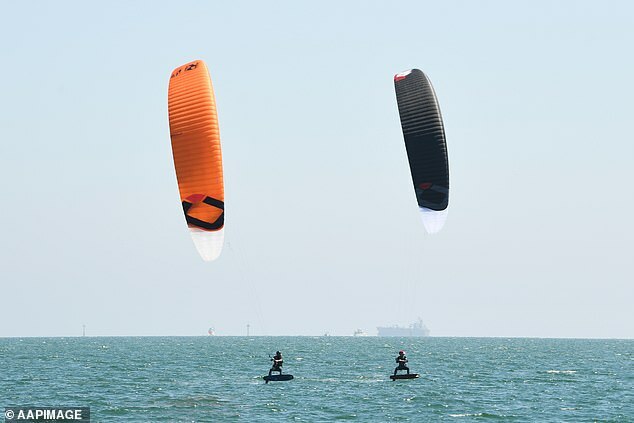 Weatherzone meteorologist Lachlan Maher explained that strong northerly winds brought hot air mass across from South Australia. 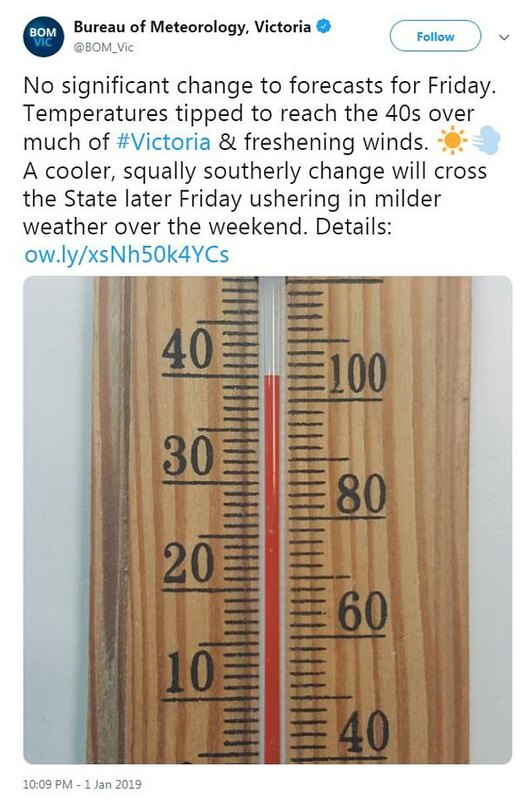 ‘A strong northwesterly wind present over much of the western parts of the state (Victoria) and that will help bring in some hot air mass from a low pressure trough that’s extending from the interior,’ Mr Maher said. 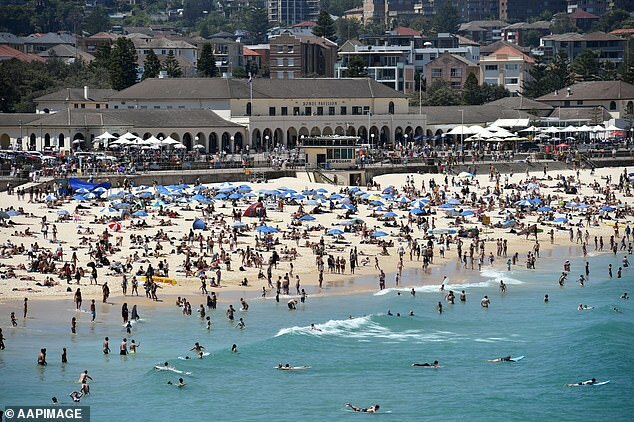 Sydney is also feeling the burden of the heat as the harbour city ednures a prolonged period of heat. ‘Since the 28th of December temperatures have been at their lowest 4C above average,’ Mr Maher said. 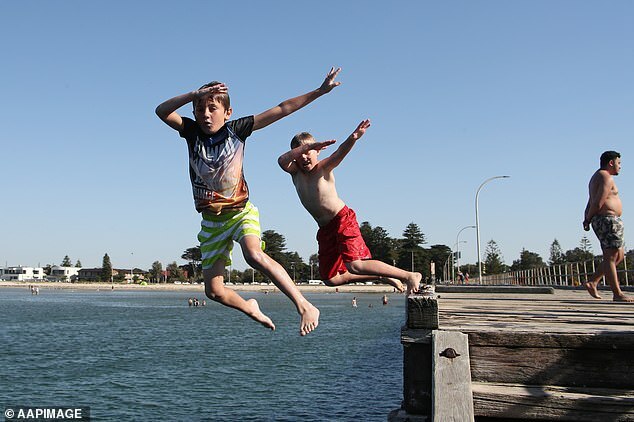 Parts of Tasmania are also expected to nudge the 40C mark on Friday. 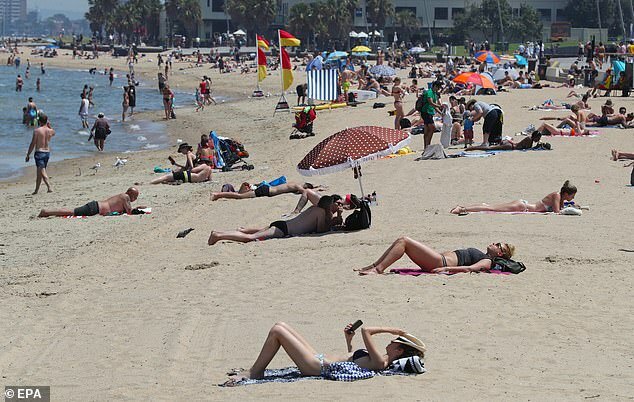 The Bureau has forecast 36C for Hobart and Campania and Brighton in the state’s southeast are expected to soar to 39C. 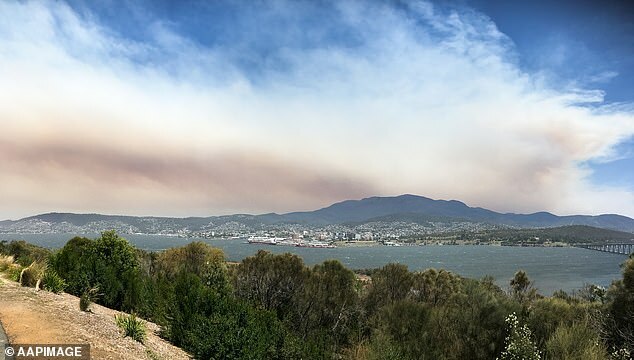 A total fire ban has also been declared for the east half of Tasmania on Friday. 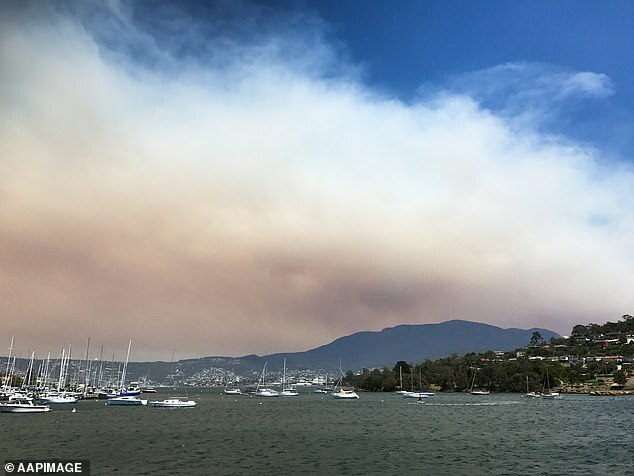 Hobart became engulfed by thick dark smoke on Friday after bushfires in the southwest. 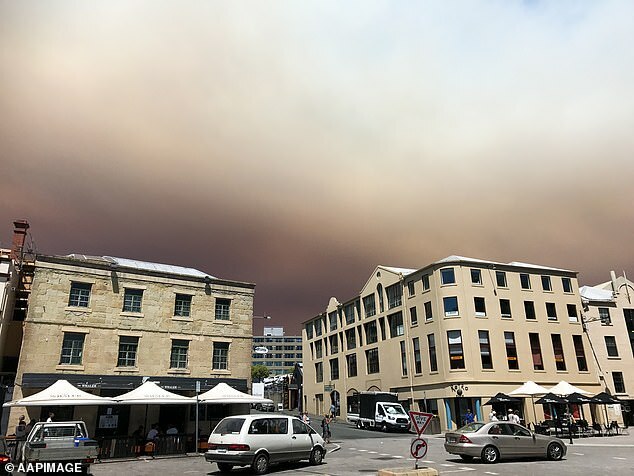 Pictures shared on social media showed the sky became covered by black and orange smoke. The fire at Gell River, north west of Maydena, Tyenna, Mt Field and National Park is uncontrolled, the Tasmania Fire Service said. Flights are also facing delays amid the conditions. ‘#JQ707 to Hobart is now being diverted to Launceston Airport due to weather conditions in Hobart,’ Launceston Airport tweeted. There is a cool change anticipated to bring relief on Saturday. Queensland is keeping a watchful eye over the latest tropical cyclone. There were fears in Far North Queensland that Cyclone Penny, which devastated areas around Cooktown with heavy rainfall and howling winds of more than 125km/h, could re-form. Penny crossed the cape and headed out to sea after losing cyclone status, but was expected to gather enough water and wind while over the ocean to become a category 2 cyclone. Brisbane stays at 30C or 31C for the whole next week with the occasional smattering of rain, but mostly a bit of cloud just hanging around. 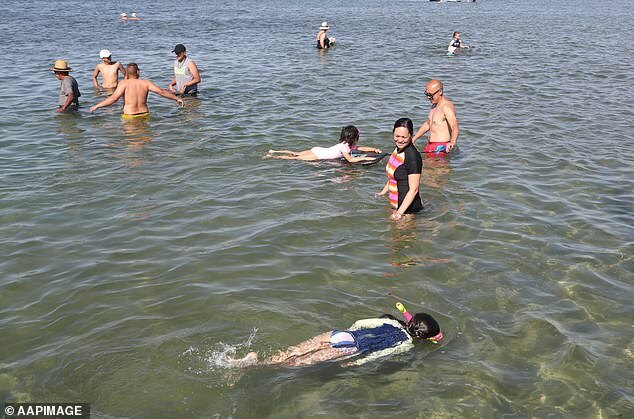 Perth is pinned to experience its usual, hot summer weather, going from 25C on Friday to 30C on Saturday and 35C on Sunday where it will stay in to next week. 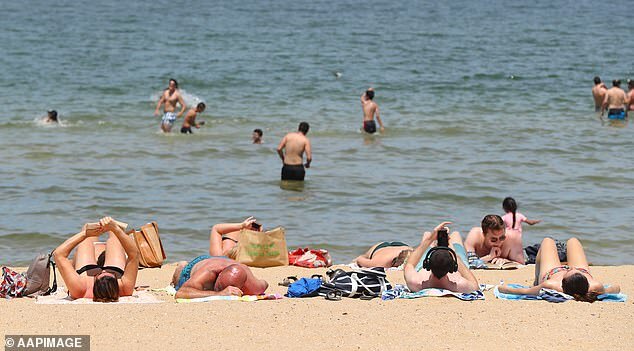 Canberra is expected to reach 38C on Friday and 34C on Saturday before dropping to 28C for Sunday. Adelaide is forecast to experience mostly sunny conditions over the weekend ranging from temperatures in the mid 20s to the low 30s. Darwin is forecast for 33C over the weekend with the possibility of storms.